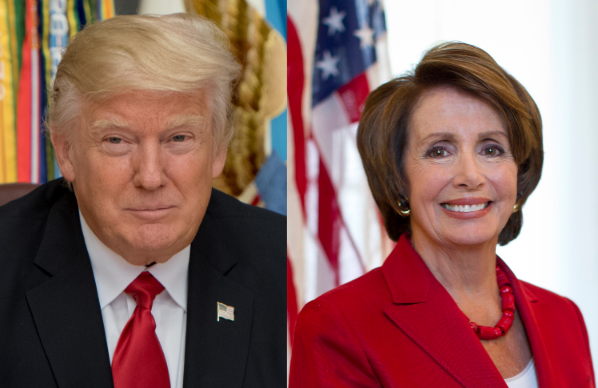 Nancy Pelosi or Donald Trump: Who Will Still Be Standing in 2018? Already, the odds makers are sharpening their pencils, the pollsters refining their samples, and the heavyweights collecting the campaign cash. With the Republicans in control of every branch of the federal government: House, Senate, White House and Supreme Court—meaning they hold all the power—one would expect the Democrats to be in disarray and at a loss for funds. Just the opposite has happened. Being the minority party has given the Democrats some backbone and some unexpected discipline. And Nancy Pelosi (after surviving a lame attempt to oust her as minority leader, due to the serious losses in 2016) has again proved her prowess as a serious fundraiser. In the first six months of this year, Pelosi has held 124 VIP events in 22 cities and raised and impressive $26 million. Her own staff admits she is never going to give up. She believes she can be Speaker of the House again. While behind Republican Paul Ryan’s $31 million haul, Pelosi’s fundraising constitutes an impressive start for a minority party. In addition, the Democrats have added an unusual display of discipline to these financial gains. The party held the line on the “repeal and replace Obamacare” debacle and toned down the ill-advised early edition of “impeach Trump,” while keeping the spotlight on the President’s erratic tweeting, the unfolding Russia investigation, Trump’s “chaos theory” of government and his lack of legislative accomplishments. The six months’ “Trump failure to deliver” list has already been posted. The Democrat leadership senses an opening and has begun playing the longest game in politics—the 18 months until the next Congressional election in November 2018. They have some history on their side. The party controlling the White House almost always sheds seats in an off-year election. “The President’s party has shed House seats in 36 of 39 midterms stretching back more than 150 years, with an average loss of 33 seats — well above the 24 pickups the Democrats need to take the chamber next year,” The Hill reported. Various House generic ballots have the Democrats up between 6 and 18 points, with the President’s approval rating uniformly below 40 percent in all major opinion polls. It is a bit too early to tell, but various local wins for the Democrats—in former Trump supporting precincts—could be a sign of looming disaster for the Republicans. Watch Montana’s special election Thursday for more tea leaves. Still, the President could turn things around. Luck (as in a robust economy), a righted White House ship with General John Kelly as his new chief of staff, a spotlight anywhere other than the Mueller/Russia investigation, fewer “alternative facts,” and a policy success in tax reform, health care or a massive infrastructure bill would help. The President still has the thunder, the power, and the ability to change course, right the ship and sink the Democrats into oblivion. However, if he persists in throwing small fits, tweeting “stink bombs” (brilliant and diabolical) to detract from unfriendly fire, and encouraging spiteful in-house warfare, then the damaging “leaks” will continue. And the Republicans will be returned to minority party status. Time for the President to govern. Or else, Nancy Pelosi, not Donald Trump will be the one still standing in 2018.